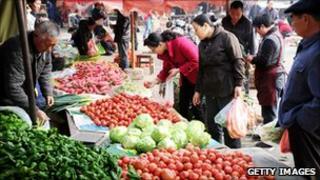 Image caption Food inflation in China means some are struggling to afford to eat. In China, life for a lot of people is starting to feel more expensive. In March, consumer price inflation (CPI) rose to 5.4%, the sharpest increase in three years. China is enjoying double digit economic growth, but as the World Bank has pointed out, avoiding what is known as the middle income trap won't be easy as its economy continues to grow. Moving from being a "middle income" to a "high income" country is a lot harder than moving from being a "low income" to a "middle income" place to live. China's per capita income was around $3,650 (£2,190) in 2009, the most recent year for which detailed figures are available, making it a "lower-middle income country". It still has the second-largest number of poor consumers in the world; only India has more. So far this year, increases in the minimum wage in different parts of the country have ranged from 10% to more than 30%. On paper at least, the incomes of the country's poorest should be rising in line with economic growth, and ahead of inflation. But, of course, the real situation is more complicated than that. Within the CPI basket the prices of some goods, particularly food, have been rising by far more than the headline figure. Image caption Designer Li Xiangwen struggles with the cost of living in Shanghai. And for those in the middle classes, who earn far more than the minimum wage, pay rises of 10% are not necessarily the norm. Li Xiangwen is a senior art designer at a magazine in Shanghai. She lives on a good wage, but struggles, she says, with the cost of living in this expensive city. She has bought a flat, but it is not close to her office, so she has also bought a car in order to get to work easily. "After paying my mortgage and the expenses for my car, there's not much left," she says. Both those purchases mark her out as one of China's richer consumers. But like many young professionals living in cities in Europe, where inflation is also climbing, she says she does not feel well-off at the moment. "I feel the pressure on me is quite high," she complains. In many ways Li Xiangwen has achieved the Chinese dream. She has a good job, a car and a roof over her head. She says she earns more than three times what her parents used to, but she does not get the subsidies they did. She is paid more than they were, but also has to spend a lot more. "Most of their generation had houses provided by the state," she says. "They had company shuttle buses they could take to work. It was rare for people to have their own cars, so they saved quite a lot." "The gap between the wealthy and the poor wasn't so big, so people felt quite happy most of the time, quite comfortable and relaxed." Today, she believes it is different for the city's younger workers. They face greater competition for each job, as well as high inflation. If they are lucky enough to own their own home, there are high costs to service the mortgage. "When everyone else has a house or a car, inevitably you feel the pressure. You feel you have to work hard on your life, so even if you have these possessions you don't necessarily feel happier than your parents did," says Ms Li. Shanghai is transforming itself into a world class city, and that is pushing up the cost of living there. House prices have been rising for months now. The public transport system has been expanded, but it does not feel affordable for those on the lowest incomes. Before the economic reforms, it was difficult for anyone without a Shanghai registration to come to work here. Now, it is allowed but certainly not easy. Migrant workers come to the city because they can earn more than they would in the countryside, but without a local registration, their access to many services is limited. A recent study by Shanghai University found that 49% of those interviewed earned less than 3,000 yuan a month. That works out at about $15 a day. That is a liveable wage in some parts of rural China, but in an expensive city like Shanghai the money does not go far. Almost 40%, though, say they are happy as long as their salaries increase in line with the country's economic growth. The city's mayor has been encouraging businesses to offer pay rises along those lines. He has admitted that people struggle to live on the city's minimum wage, which was increased by 14% on 1 April to 1,280 yuan ($194; £116) a month. Migrant workers like Xie Shuxiang, a cleaner or "ayi", from Henan province understand what he means. Image caption Migrant worker Xie Shuxiang is concerned about rising food prices in Shanghai. She says 80% of her income goes on rent and paying for the education of her children back home. She saves about 19% and says she spends just 1% of what she earns on food. Rising food prices are a big concern for her, with inflation causing her real problems. "If you go to the wet market now the cost of vegetables is increasing, and other stuff too," she says. "A bag of flour used to cost 40 yuan but now it costs 70 yuan. For me that's a big difference." Andy Rothman, China macro strategist at CLSA Asia-Pacific Markets, says that even if it feels more expensive to live in cities, the reality for most urban residents is that incomes are still rising by more than inflation, as they have been for several years now. "People here are going to have to get used to a significantly higher level of inflation in the coming years," he says. But he points out that, whereas in Europe wage increases in many companies are falling behind inflation, here it is different. "The income growth has been so fast, double the inflation rate or more, that you can grumble about it, but it's probably not going to cause real hardship for too many people." The reality, he points out, is that people like the designer Li Xiangwen, are now simply facing the realities that young professionals in other world-class cities have to deal with: shortages of affordable housing close to where they want to work, high competition for well-paid jobs and pressure to keep up with friends who are also consuming. Looked at that way, the pressures could be regarded as a sign of China's development rather than an indication that something is going wrong.